Nexenta recently participated in the Citrix Ready VDI Capacity Validation Program for Storage Partners white paper, resulting in a series of reports looking individually at how a variety of storage solutions implemented Citrix XenDesktop using the VDI FlexCast approach. What we found most interesting about the report, however, was the economics of storage vendors that was made transparent as part of this process. We weren’t the only ones to notice. Take a look at this graphic from a recent blog post entitled The real cost of VDI storage by Gartner Research Director Gunnar Berger. 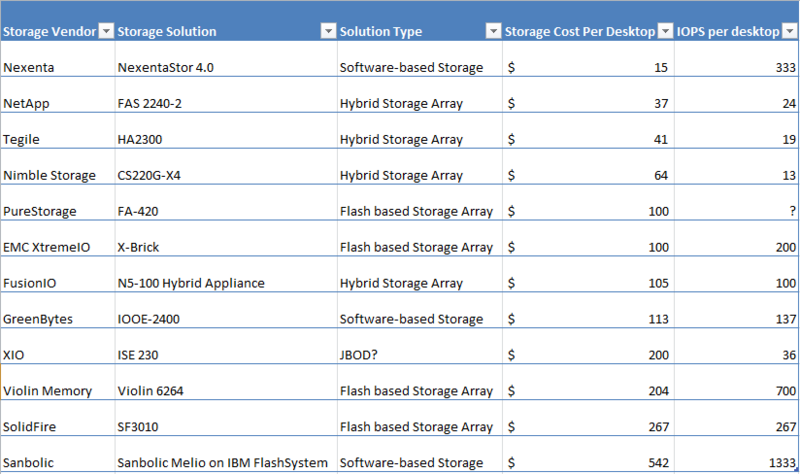 Berger created this comparison chart of the cost of storage per desktop from all twelve vendors that received verification from the program. Nexenta delivers the most cost-efficient storage solution for Citrix XenDesktop users, providing an unprecedented full-featured storage solution for $15 per desktop. This beats the nearest competition with savings of $22 per desktop. The last-place finisher in Citrix’s validation testing was an astounding 36x more expensive than NexentaStor, NetApp was approximately 2.5x more costly than Nexenta and EMC more than 6.5x more expensive. This validation demonstrates what we’ve known for some time: that the Massively Expensive Storage System (MESS) vendors have been giving storage a bad name and preventing IT departments all over the world from developing a true VDI environment. In the Citrix validation study, Nexenta delivered the best operational performance with the best ROI. Simply put, Nexenta shattered the competition. Nexenta is working tirelessly to help customers implement a software-defined approach to data center storage. We’re proud of these results and will continue to innovate in order to help customers unlock the true ROI potential of their move to VDI and a software-defined data center.